cleaning onions Onions are plants of the species Allium cepa, which originated in central Asia but has spread across the globe in hundreds of different varieties. 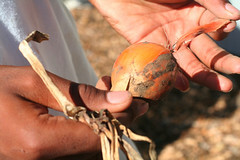 The key to the onion family's appeal is a strong, often pungent, sulfury flavor whose original purpose was to deter animals from eating the plants. Cooking transforms this chemical defense into a deliciously savory, almost meaty quality that adds depth to many dishes. The onion family accumulates energy stores not in starch, but in chains of fructose sugars which long, slow cooking breaks down to produce a marked sweetness. This week we say goodbye to our Summer Youth Program. These 60 high school students have transformed our farms with all their hard work removing weeds, harvesting thousands of pounds of produce and bringing their work ethic on hot sticky days and cold rainy ones. The noise decibel at lunch time has risen exponentially over the last six weeks as strangers grew into friends. For some this program was only the beginning of their time with The Food Project; many will return for our Academic Year Program and someday you might meet them as interns helping you at the CSA. Goodbye SYP and thank you for all your hard work and great energy. Shares for all sites will be $74 for 9 weeks of fruit from Autumn Hills Orchard in Groton. You'll receive 1/2 peck of fruit per week. The share will consist mainly of an exciting variety of apples with a few pears and plums in the mix. On Farm CSA members need to specify which day (either Tuesday or Thursday) you'll be picking up your fruit. Sign up for your share online today! Update: information on the tomato blight has been moved to this post. Sign up ends August 21st. Fruit shares will go from the first week of September through the last week of October. Thanks to all of you who came out for the CSA potluck last week. Even under rain-threatening skies, we had a great dinner shared by all. The kohlrabi cook-off was a huge success with many tasty dishes being offered. Check our blog next week for the recipes! broccoli Believe it or not, broccoli was barely known in the US until the 1920's. It's a snap to cook and delicious and nutritious. Serve it raw, lightly cooked or completely cooked. One other thing to believe or not: broccoli is a flower--a bunch of flowers to be exact. All those tiny buds just haven't opened yet. If we let our broccoli plants keep growing in the fields without harvesting them, they'd eventually erupt into a lovely bouquet of tiny yellow flowers. Broccoli is a plant of the cabbage family Brassicaceae. 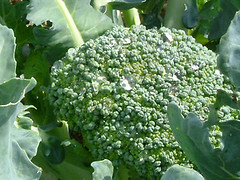 Broccoli most closely resembles cauliflower, which is a different cultivar group of the same species, but broccoli is green while cauliflower can appear in purple and yellow in addition to the traditional white variety. Packing a nutritional punch, broccoli is high in vitamins A, C, and K as well as dietary fiber.